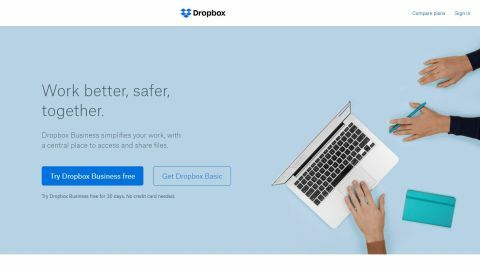 Dropbox is quick to install and use, although compared with other cloud services it doesn’t offer the same value for money or flexibility that the likes of Microsoft or Google boast. For many, Dropbox was their first experience of cloud storage, and as a result, they ended up sticking with it. Being early to any party has both advantages and disadvantages, but Dropbox’s has effectively minimised the downsides and made its maturity a major selling point. However, it isn’t without fault, and the likes of Google and Microsoft have its substantial user base of 500 million customers squarely in their crosshairs. Dropbox first appeared in 2007, and with eleven years of development behind it, this tool undoubtedly delivers a slick and evolved solution. In all the operating systems it supports the objective has been to merge it seamlessly in a way that anyone who understands folders and files should be comfortable. Also, there is a residential software component that keeps you informed what’s recently synced to the Cloud, and when. Those folders you’ve chosen to synchronise can be easily adjusted, and the sync selectively paused, should you be expecting a significant number of changes and don’t wish to secure them all. By default, Dropbox creates its own folder and encourages the user to place any folders in there that they’d like synced. But you can switch that top level to any folder, should you not wish to reorganise your existing folder model. The snag with this is that however you configure it, all the files must exist under a common tree structure. That’s a long way from being a sync-any-folder approach, and that you must bend your folder hierarchy to the Dropbox system to have the files secured isn’t ideal. Along with specific operating system support for Windows, MacOS, Linux, iOS and Android, there is also a web interface that allows you to access your Dropbox files from any computer that has a compliant browser. The exact feature set you get is entirely dependent on which level of Dropbox you have, and by definition how much you pay each month for that facility. For individual and team users each has two levels; Plus or Professional, and Standard or Advanced. Each offers different levels of storage, file history cycles and administrative tools. They all come with 256-bit AES and SSL/TLS encryption, remote device wipes and two-factor authentication. But, the higher priced solutions have better support and more storage space. The Dropbox team model is designed for a working environment where folders can be configured to be shared between specific team members or groups and globally. Administrators are also not all at the same top tier, and responsibilities can be stratified. The free Plus version has just a 30-day file history, but above that, you get a full 120-day versioning solution that is perfect for those who need to refer to previous stages of any document as to when exactly a change occurred. We are duty-bound to mention that back in 2012, Dropbox had a significant security disaster where the accounts of 68 million users became compromised. What was even more concerning about this breach was that the incident wasn’t made public until 2016 when the company was also indirectly linked to the NSA PRISM cloud service project. Like Google, Microsoft, Box and others Dropbox hasn’t implemented end-to-end encryption on either storage or file sharing, or zero-knowledge authentication. It also has 2-step verification, but the way that metadata handled in their data centres has been criticised as leaving a potential gap for exploitation. Dropbox is fairly adamant that their solution is secure, but historically they don’t have a great track record of admitting when it patently isn’t. Dropbox has two alternative offers, one through Dropbox.com and another they’ve branded Dropbox Business. Basic Dropbox has four levels of storage called Plus, Professional, Standard and Advanced that offer 1TB, 2TB, 3TB and ‘As much space as needed’ respectively. And, there is a ‘Free’ mode where they give you 2GB to experiment, additional space requires a contract. The paid options start from $9 (£6.58) to 19.60 (£15) per month based on yearly billing. Dropbox Business has three levels; Standard, Advanced and Enterprise. Standard provides you with 3TB for$15 (£12) per month or $150 (£120) for the year. Advanced is $25 (£18) per user per month without any space limitations. Each of these is for a single user, and you must have at least three users on an account tripling those amounts. Enterprise tier is a quotable solution aimed at largest businesses where they want everyone to have access to a corporate Dropbox account. These costs are calculated on employee numbers and usage, presumably. The Dropbox Business product doesn’t differ much from the team orientated Standard and Advanced levels of vanilla Dropbox. Although there are more checks and balances on what users do through the service and they also provide API access to platform partners wishing to fully integrate their internal services to Dropbox technology. What all those who sign up to the services with unlimited storage should realise is that they get 3TB, to begin with, like the tier below, and must ask support to increase their current limit before they hit that 3TB wall. So how does this pricing compare with other Cloud services? Dropbox isn’t the cheapest Cloud storage solution, as both Microsoft and Google undercut it for 1TB, and also offer additional functionality. When you factor in the lack of productivity applications and the inflexibility of their solution regarding folders, Dropbox shouldn’t be your first choice.